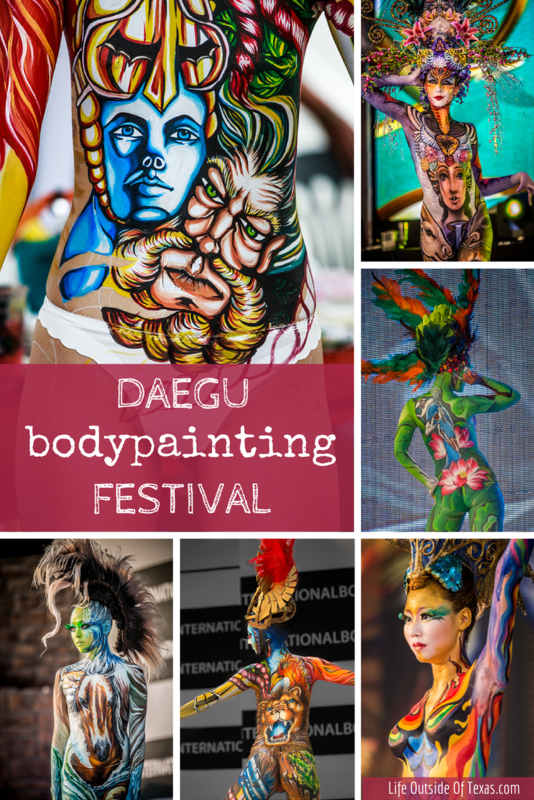 Every year artists from all over the world gather in Daegu, South Korea to compete in the Daegu International Bodypainting Festival. The entire festival is so fascinating because you can watch the models’ bare skin transform into gorgeously painted canvases in a matter of hours. The festival is broken up into two categories: Bodypainting and Fantasy Make-up. In the bodypainting competition, the models are nearly naked; most only wear underwear and tape over their breasts. The artists are given six hours to complete their masterpiece. The participants are judged on technique, originality and overall completion. We were really amazed at how patient the models were while they were being painted. Not only were they being painted, but they were being watched, pointed at and photographed by spectators. Most of the participants just ignored the crowds and ate or played on their phones, but a few spent the entire six hours posing for every. single. photo. At the end of the six hours the models proceeded to the stage to present their costumes to the crowd and judges. The winners were split into a top 3 and then three additional participations won an “prize for encouragement” which I assume is similar to honorable mention. 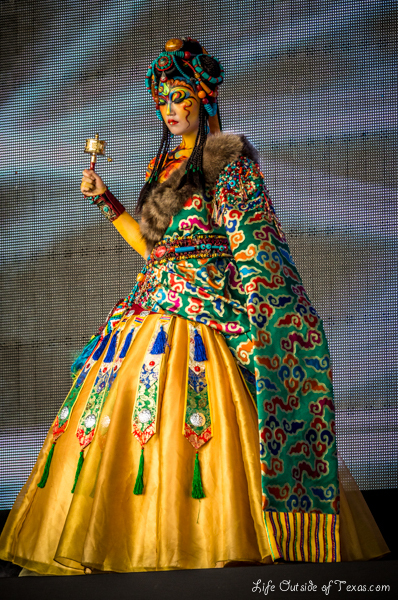 The fantasy make-up competition focuses on elaborate costumes. Because the whole body isn’t painted, the time limit for the fantasy make-up competition is only 4 hours and the participants are judged on technique, originality and use of costume. The fantasy make-up competition presentation was actually a lot of fun to watch, but almost a little unsettling. The models had to wear huge dresses, outrageously high heels and giant headdresses, which made them incredibly clumsy on stage. There were lots of wobbles and almost trips, but overall I thought the models did incredibly well considering the circumstances. The festival is located at Kolon Field Concert Hall inside Duryu Park in Daegu. If you plan on driving, pick your parking spot wisely. Last year there was also a Miss Korea event taking place in Duryu Park. We got what we thought was a fantastic parking spot on the side of the road, only to come out at the end of the night to find another row of cars had formed right next to ours. Luckily, we were able to hop the curb and reverse down the sidewalk, otherwise we would have been stuck there for quite a while longer. 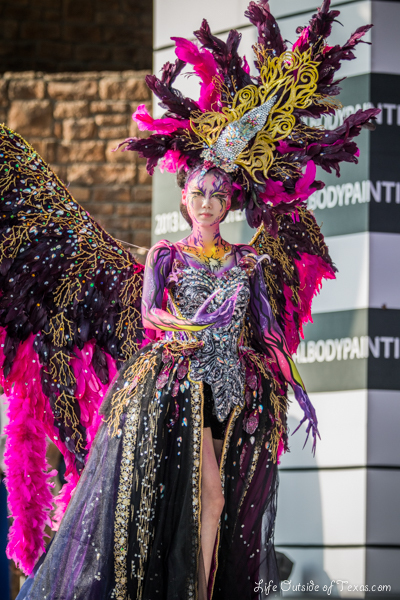 Please let us know in the comments if you found this post helpful or if you plan to attend the bodypainting festival. Don’t forget to LIKE US on Facebook for more about life and travel in Korea. This entry was posted in Daegu, Festivals in Korea, Summer and tagged body painting festival, bodypainting, bodypainting festival, korea festival, korea guide, south korea tourist attractions, things to do in daegu, visit korea by Meagan & Dave | HappilyEverExpat.com. Bookmark the permalink. Wow, this is amazing!! I’m super tempted to go this year, will you and your man be going? You took such amazing pictures, great job!! Thanks, Kirsten! We thought about going back because we really enjoyed it, but we decided to go to a vineyard instead. The wine wins! haha You should definitely check it out though. It’s really interesting, and it’s a great chance to practice photography. haha Yeah, apparently there’s one main vineyard in Korea and it’s somewhere south of Daejeon. We are going to check it out over the weekend. I’ll let you know if it’s any good! Thanks! We had a lot of fun last year. If you go, let me know how it goes. Hopefully the weather will be nice this weekend! It’s a great festival, too bad you’re going to miss it. Hope you’re enjoying your last few weeks in Korea! These are absolutely stunning! It would be so cool to get down there this weekend! Thanks for posting the details! Thanks, Laura… I hope you were able to check out the festival. I heard it was a lot of fun this year. I’m going to this on Saturday! How was it? Did you have a good time? Wow, such fantastic pictures. It’s too bad I couldn’t make it this year. Hopefully there’s enough interest to keep this very interesting festival going. Thanks! It’s been going on a few years now so you may get another chance to go next year if you guys will still be around. It was a really fun day! That’s some insane talent on display! And unlike a tattoo, they get to take it off at the end of the day 😀 Great photography as well, you captured all the colour really well. Thanks, Andrew! I couldn’t imagine being that still for 6 hours though… what patience those models have! I was blown away by all of the talent as well. Yay! I’m so glad you went and you had a good time. Thanks for letting me know. That makes me really happy! Incredible! Of course, the art work is amazing, but the fact that a person can sit or stand pretty still for all those hours is impressive. WOW! These are unbelievable photos!! Festivals like this one are some of my favorite things about Korea. I wasn’t able to fit this one into my plans, so thank you for capturing it so beautifully for those of us that couldn’t attend! Isn’t it all so beautiful? !